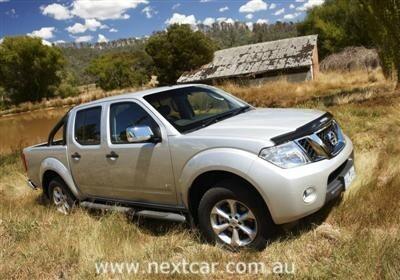 The Nissan Navara, is set to extend its popularity in 2012 with a revised model range, significant equipment upgrades and even better value. A key change to the D40 range is the increased availability of Nissan’s class-leading 550 Nm/170 kW V6 turbo-diesel engine in more models at adjusted, more attractive prices. New to the range for 2012 is the ST-X Dual Cab 4X4 Navara with the 3.0-litre V6 turbo-diesel and 7-speed automatic transmission with manual mode, priced from $56,990* (MLP*). This represents a $4,000 price saving over the similarly-engined 2011 model ST-X 550. Meanwhile the 2012 Navara ST-X 550 4X4 is now equipped with leather trim; satellite-navigation and hard drive; Bose audio and reversing camera. Significantly, it is also priced $2,000 lower at $62,990*. The top-selling Navara D40 ST Dual Cab 4X4 has also been upgraded with a more powerful 2.5-litre four-cylinder 450 Nm/140 kW diesel engine, standard 17-in alloy wheels, 5-Channel Utili Track and receives six airbags. Both V6-engined models and the D40 ST Dual Cab have a braked-trailer towing rating of 3,000 kg. All 2012 D40 four and six cylinder diesel Navara models are now equipped with Nissan’s Vehicle Dynamic Control (VDC) and three-point seat belts for all passengers. The D40 Dual Cab 4X4 Navara has received an ANCAP 4-star rating, underscoring the increased active and passive safety measures for 2012. The Navara RX Single Cab moves from bench to bucket seats and gets a carpeted floor, with standard rubber mats. The Navara D40 remains the sharpest Tradies’ tool on the Australian market with Nissan’s acclaimed 550 Nm/170 kW V6 turbo-diesel V6 engine now fitted to two models. Previously only available in top-luxury ST-X 550 specification, the D40 range has been expanded to two models with the arrival of the new V6-engined Dual Cab ST-X 4X4 Navara priced from $56,990*. Privacy glass (in the second row). Satin black sports bar with integrated LED stop light. It is priced at $62,990*. That's $2,000 less than the previous ST-X 550 (with the Premium Option package). CD player with USB connectivity. The Managing Director and CEO of Nissan (Australia) Dan Thompson (who is leaving for Nissan Europe soon to take up an executive posting in Switzerland) said the revisions to the Navara range further strengthened Navara’s aim to wrest leadership from the strong-selling Toyota Hilux in the highly competitive Australian ute market. 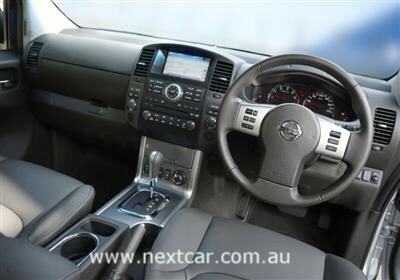 “Navara is one of Nissan Australia’s cornerstone products aimed at giving us number one importer status,” Thompson said.